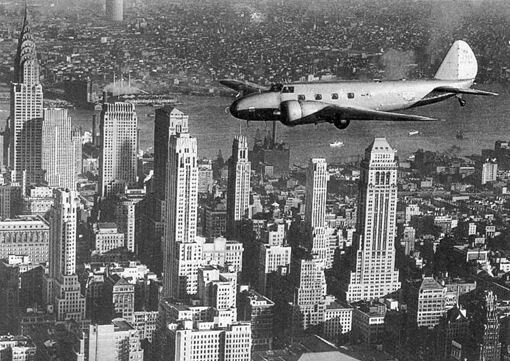 8 февраля 1933 года фирма "Boeing" подняла в воздух прототип нового авиалайнера, получившего обозначение Boeing Model 247. При компоновке этой машины группа конструкторов использовала аэродинамические и конструктивные решения самолетов Model 200 и Model 215. Model ДальшеMore>>> 247 считался прототипом современного авиалайнера, представляя собой обтекаемый моноплан цельнометаллической конструкции с низкорасположенным свободнонесущим крылом, силовой установкой из двух двигателей и колесным шасси с убираемыми основными стойками. Он также имел закрытую кабину для двух пилотов, стюардессы и 10 пассажиров. Самолет мог взлететь с полной нагрузкой и поддерживать высоту полета даже при одном работающем двигателе. К тому же в его компоновке присутствовали новые элементы гражданского транспортного самолета, а именно пневматические антиобледенительные устройства на передних кромках крыла и хвостового оперения. 60 машин Model 247 были заказаны фактически прямо "с чертежной доски" для переоснащения авиакомпании "Boeing Air Transport System", ставшей незадолго до того основным отделением "United Air Lines". Еще 15 машин заказали другие компании и частные лица. Самолеты, построенные для Роско Тернера и Клайда Пангборна для участия в авиагонках Макробертсона в 1934 году по маршруту Англия - Австралия, были оснащены дополнительными фюзеляжными топливными баками вместо стандартного оборудования пассажирского салона, обтекателями двигателей типа NACA, снижающими лобовое сопротивление, и винтами изменяемого шага для улучшения летных характеристик. Эти улучшения позже использовались на большинстве Model 247, доведя их до стандарта Model 247D, который включал в себя также сдвигаемый назад, а не вперед фонарь кабины пилотов. С вступлением США во Вторую мировую войну в декабре 1941 года 27 самолетов Model 247D использовались авиацией Армии США под обозначением C-73. Предполагалось, что они могут служить для перевозки грузов и личного состава, но оказалось, что двери его пассажирской кабины слишком узкие. Вместо этого C-73 использовались для переброски летных экипажей, а позже для обучения. В ходе эксплуатации они были переоснащены звездообразными двигателями Pratt & Whitney R-1340-AN-1 мощностью 600 л. с. (447 кВт). В конце 1944 года самолеты вернули на гражданские авиалинии. DESIGNED especially for speedier transportation of passengers by air, a plane that will slash hours from present coast-to-coast flying schedules has been designed by the Boeing Airplane Company, of Seattle, and a large order has been placed in production for United Air Lines. The new transport, which will be powered with two special 550-h.p. "Wasp" engines mounted forward of the leading edge of the wing, will have a high speed of 175 m.p.h. and a cruising speed of 155 m.p.h., with full load of fuel for 500 miles, 10 passengers, 500 lb. of mail and express and crew of two. With this load the plane will be able to climb to an altitude of 18,000 ft., or 6,000 ft. higher than is necessary to cross the highest mountains on the transcontinental airway. As a result of the unusually large range of the new planes, the longest divisions existing on the transcontinental line can be flown without stopping for fuel and with a reserve of 35 per cent, of fuel in the tanks to care for adverse weather conditions and other contingencies. The flight from coast to coast can be made with only six stops for refuelling, where 14 stops are now required. The new transport will have a wing span of 74 ft. and a chord of 15 ft. at the fuselage. It will be 16 ft. in overall height and 51 ft. 5 in. in length. Fully loaded, it will weigh approximately six tons. The plane is of Boeing semi-monocoque all-metal construction, duralumin being used chiefly. It embodies principles successfully employed in the Boeing twin-engined monoplane bomber produced last year for the Air Corps, which was illustrated in our issue for November 13, 1931, and also the Monomail, an all-metal, single-engined monoplane now being operated by United Air Lines. Features of the transport include full streamlining and freedom from parasite drag, along with a retractable landing gear. It is being completely bonded and shielded for radio telephone installation, and latest aids to night flying in the form of lights and flares are to be incorporated. The spacious cabin, which will have an interior height of 6 ft., will include such travel conveniences as hot-water radiators with air-circulating fans which may be inverted for use as cooling systems during the summer season; a double ventilating system, including main fresh-air intakes and air outlets, supplemented with individual ventilation facilities; insulation to subdue noise; lavatory, and individual reading lamps at each chair. The upholstered seats will have adjustable backs which may be set to reclining position. The chairs are to be spaced 40 in. apart. The forward compartment for pilot and co-pilot will be perhaps the most modern of any transport aeroplane cockpit, and includes features being used for the first time on the new Boeing. There will be a special rudder flap control to permit more than ordinary ease of directional control, along with an adjustable elevator flap to compensate for variations of loading conditions. The retracting mechanism for the landing gear will be operated electrically, with a manual auxiliary control provided for emergency use. If the landing wheels are in retracted position when the pilot closes the throttle prior to landing, warning lights on the instrument panel and also audible signals remind him to lower the gear. In addition to standard navigating instruments, there are to be three pairs of instruments whose functions are duplicated. These include the directional gyro, and compass; the sensitive altimeter, recording elevation in hundreds instead of thousands of feet, and the rate of climb indicator; and the turn and bank indicator and the artificial horizon. 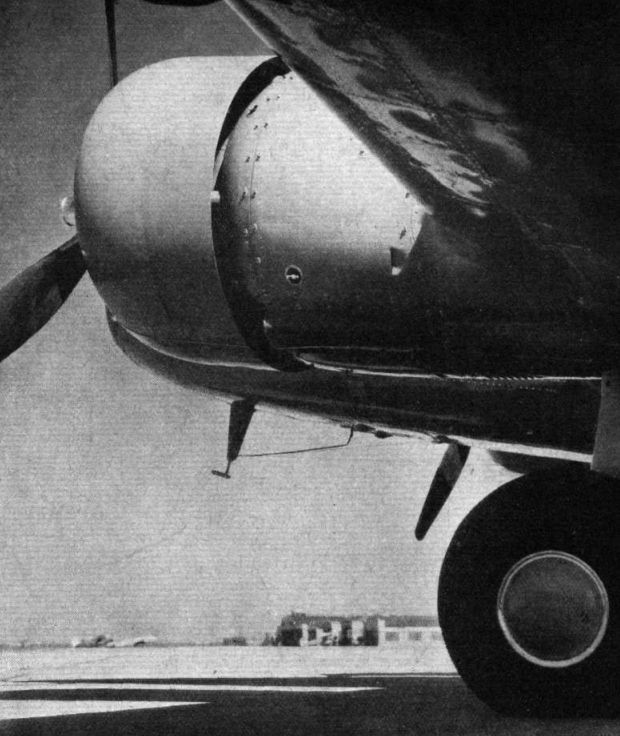 A feature of the pilot's cockpit will be the inclusion of a gauge by means of which pilots may read the cylinder head temperatures of any of six individual cylinders. 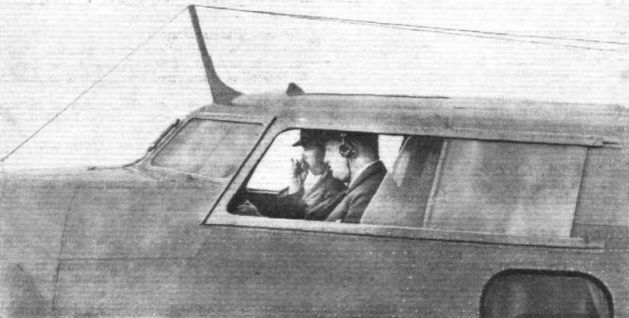 An outstanding feature of the plane is to be the excellence of visibility provided in the cockpit. 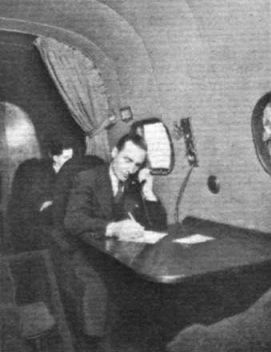 Compartments directly in front of the cockpit will house mail and the radio telephone equipment, and additional space at the rear of the passenger cabin will accommodate baggage and express. Developed from the Boeing 247 described in Flight of June 15, 1933, the model 247-D flown by Col. Roscoe Turner and Clyde Pangborn differs from the original model in that it is fitted with two 550 h.p. geared and supercharged Pratt & Whitney "Wasp" S1H1-G engines, with three-bladed Hamilton Standard controllable pitch airscrews and long chord cowlings instead of S1D1 "Wasps", with cowlings short chord. These modifications have added 20 m.p.h. to the top speed of the machine arid a general increase in efficiency. Col. Turner's machine is the first 247-D to be flown. Semi-monococque type construction, with duralumin bulkheads, longerons, skin stiffeners and skin coverings is used for the fuselage. A cantilever type wing with a span of 74ft. is employed, consisting of spar trusses of square and rectangular aluminium alloy tubing, ribs, and smooth metal skin. Tail surfaces are of cantilever construction with front and rear spars braced with ribs of channel section, and smooth metal skin covering. Tests made by the U.S. Army Air Corps have shown that the fuselage can support a load 60 per cent, in excess of requirements. "Tabs" are used on elevators, rudder and one aileron to trim the machine and to correct unbalanced airscrew thrust. 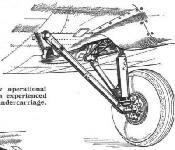 Forty-five seconds are required to retract the landing gear, which is of the divided type, using Boeing oleo shock absorbers and hydraulic brakes. Standard night flying equipment includes navigation lights, landing lights in the leading edge of the wing, and parachute flares. Dual controls are provided, and the main instrument board is equipped with thirty-five different devices. In the commercial version of the machine two-way radio-telephone equipment is located forward of the pilot's compartment. For racing purposes the wireless and D/F equipment has been placed well to the rear of the fuselage. Of the instruments provided there are three sets, whose functions are duplicated, including the directional gyro and compass, the sensitive altimeter (which records height in hundreds as well as thousands of feet) and the rate of climb indicator, the turn and bank indicator, and the artificial horizon. Normally the cabin, which is 20ft. long and 6ft. high, contains ten seats, heating and ventilating system, dome lights, reading lamps, lavatory facilities, and is insulated against noise. 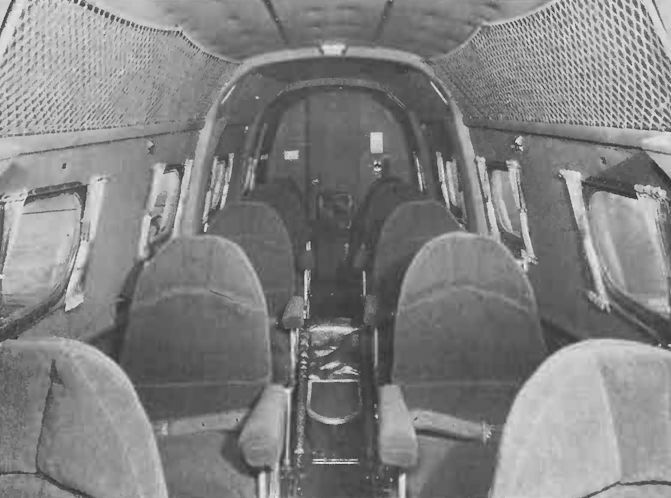 In Col. Turner's machine the extra fuel tanks for long-range flying are arranged along each side of the forward portion of the cabin with an aisle between. Figures supplied by the Boeing Airplane Company for the standard 247-D give a maximum speed of 202 m.p.h., a cruising speed at 5,000ft. of 184 m.p.h., and a landing speed of 60 m.p.h. A useful load of 4,710 lb. is carried, of which 2,582 lb. represents pay load. The empty weight is 8,940 lb., and the gross loaded weight 13,650 lb. SIXTY Boeing 247 ten-passenger monoplanes were delivered to United Air Lines during 1933. On being put into service, these machines cut existing times on the coast-to-coast, Pacific coast and other routes of that company by roughly one-third. 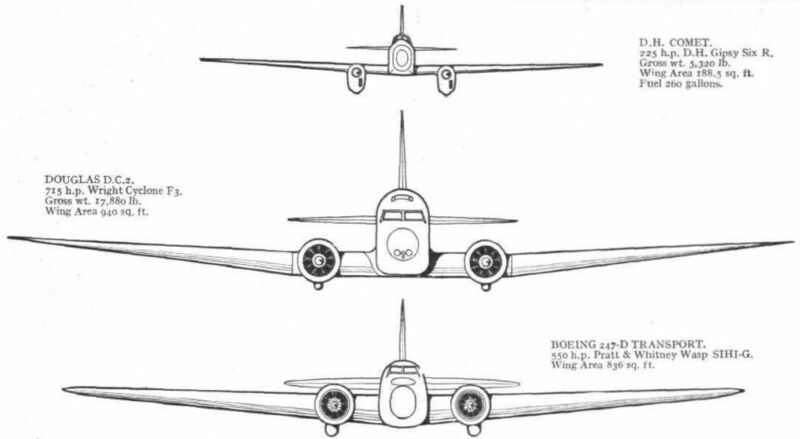 After completing this batch of 347's the Boeing Company proceeded with work on seventeen machines of similar basic design, but incorporating a number of important improvements, and known as model 247-D. Three were shipped to Germany for Deutsche Luft Hansa, another was flown by Roscoe Turner and Clyde Pangborn in the MacRobertson Speed Race, and finished third, ten have just been delivered to United Air Lines, and the remaining three are due for completion this month. 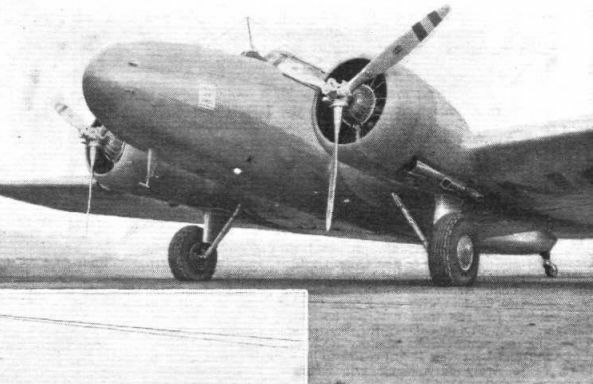 During tests the 247-D showed substantial increases in speed, range, ceiling, rate of climb, and in performance on a single engine, when compared with its predecessor. Because of the high strength factors of the 247 the new type has been licensed for a gross weight of 13,650 lb., of which the payload, including the passengers, baggage and cargo, accounts for 2,582 lb. Two geared and supercharged Pratt and Whitney "H" series "Wasp" nine-cylinder radial engines, operating in N.A.C.A. type cowlings, and driving three-bladed Hamilton Standard controllable-pitch airscrews, are now fitted. 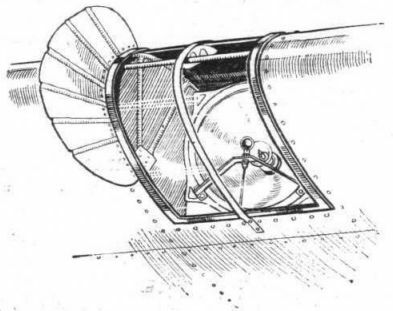 On the original 247's direct drive "Wasps," short-chord cowlings, and two-bladed "controllables" were used. The installation of the new power plants was the chief factor contributing to the greatly improved performance when flying on only one engine. In this condition the ceiling is 11,500 feet, or 6,500 feet better than that of the 247. On two engines the top speed is 200 m.p.h. and the cruising speed, at 12,000 feet, 189 m.p.h. Not only has performance been increased but the cabin has been made quieter. Features contributing to the latter include new cabin sound insulation, the elimination of individual ventilators, and the reduction of airscrew tip noise resulting from the use of geared engines. The new ventilation system embodies two intakes for fresh air with distributor ducts along the cabin ceiling, and two air outlets at the base of the cabin walls. Improved headrests on the adjustable reclining chairs are another innovation. Flush rivets are used round the leading edge of the wing and tail-plane, and metal framework with fabric covering is now employed for the elevator and rudder in the place of all-metal construction used in the 247. 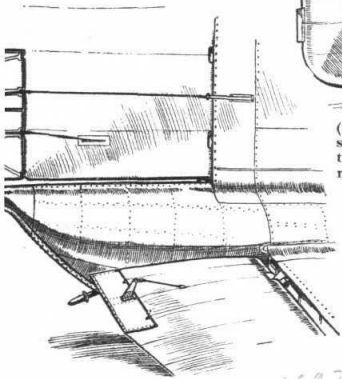 Built into the trailing edge of the rudder is a flap of divided type, the top half acting as an aerodynamic balance and the lower half serving as a trimming flap. The pilot's windshield now slopes backwards instead of forward. Incidentally, this change has also been made in certain other American transport types, so the N.A.C.A., right in theory, may have been proved wrong in the light of practical considerations. Climb to 11,000 ft. (3 353 m) 10 mins. 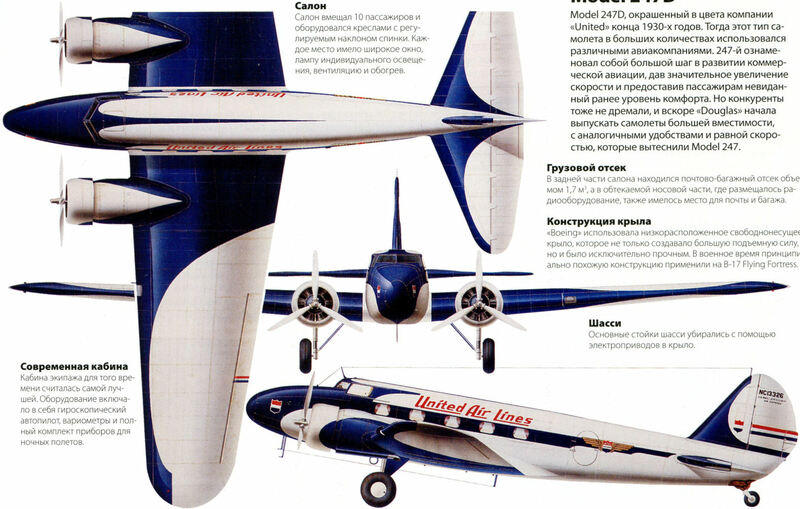 Model 247D, окрашенный в цвета компании "United" конца 1930-х годов. Тогда этот тип самолета в больших количествах использовался различными авиакомпаниями. 247-й ознаменовал собой большой шаг в развитии коммерческой авиации, дав значительное увеличение скорости и предоставив пассажирам невиданный ранее уровень комфорта. Но конкуренты тоже не дремали, и вскоре "Douglas" начала выпускать самолеты большей вместимости, с аналогичными удобствами и равной скоростью, которые вытеснили Model 247. После войны самолеты Model 247 в течение многих лет использовались мелкими авиакомпаниями в основном для перевозки грузов. Машина на снимке применялась для опыления полей до 1978 года, а затем ее передали на реставрацию. 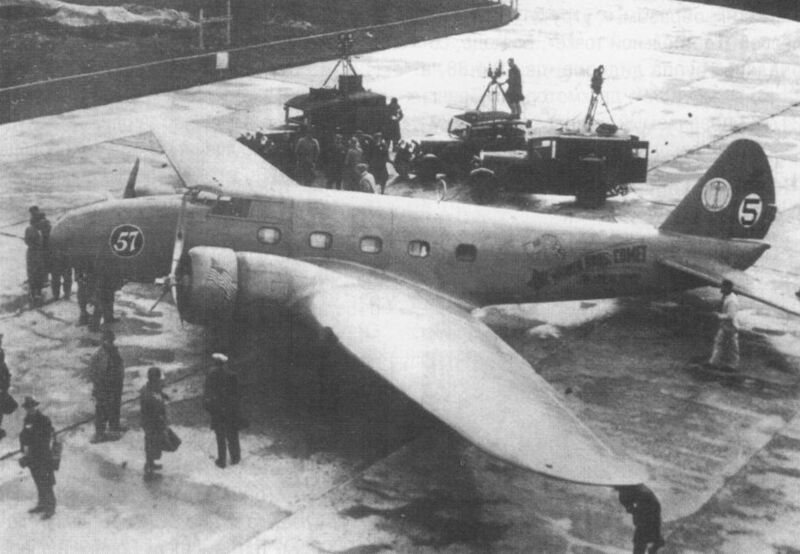 Boeing Model 247 (30 March 1933). 7 июня 1995 года "United Airlines" первой в мире начала эксплуатацию Boeing 777, первый самолет компания получила 15 мая. "United" была партнером "Boeing" по разработке 777-го, это помогло конструкторам понять и решить многие проблемы эксплуатации авиалайнеров. При участии "United" на 777-м оптимизировали систему жизнеобеспечения, багажные полки салонов и даже отделку интерьера. На фотографии 777-й стоит рядом с пассажирским Boeing Model 247, который считается первым пассажирским самолетом современной компоновки. 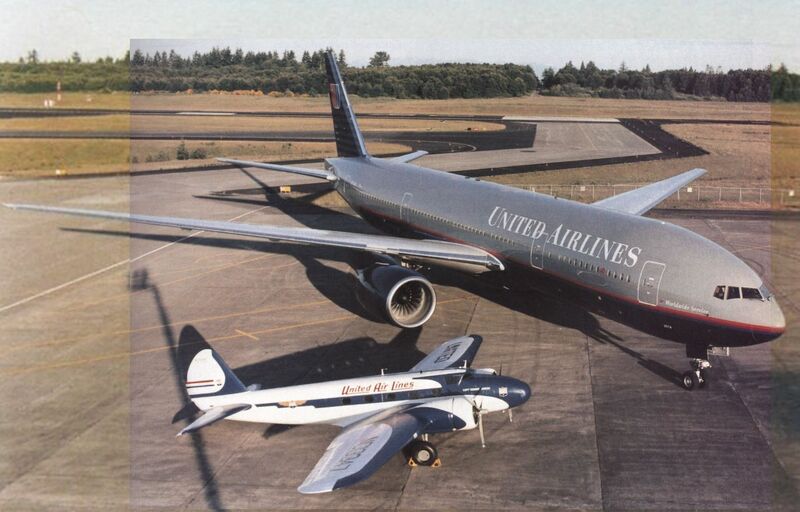 The Museum of Flight's Boeing 247D provides scale to a United Airlines 767 - 53 years separate the first flights of their prototypes. 8 февраля 1933г. : Первый полет Boeing Model 247, первого американского двухмоторного цельнометаллического пассажирского моноплана. 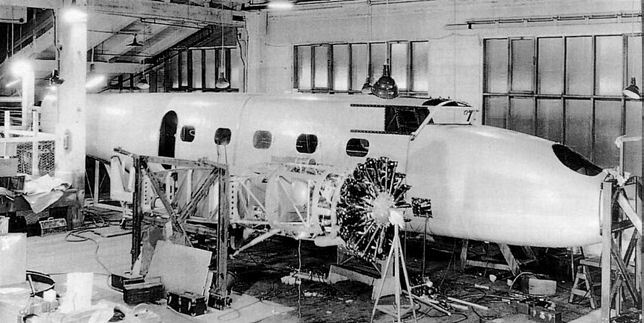 The one-off Model 247A NC13300 of 1933 was used for trials and as a corporate transport for Pratt & Whitney/United Aircraft. 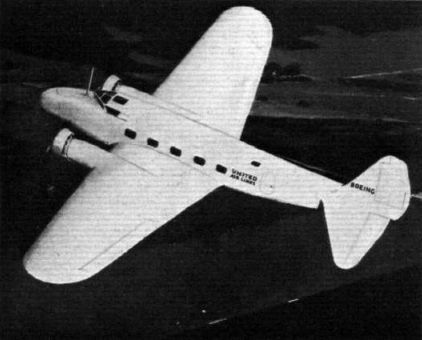 Continuing to demonstrate its world lead in the design of economically superior airliners, the US industry produced such types as the Boeing 247D (shown) and Douglas DC-2. SIXTY OF THEM IN SERVICE: A striking night photograph of one of the United Air Lines' new three-mile-a-minute Boeing 247 transports, halting briefly at Salt Lake City in the course of a Coast-to-Coast flight of less than 20 hours. All 60 of the new Boeings ordered by United, now are in regular service on the company's Coast-to-Coast, Pacific Coast, and other routes. The new Boeing Air Transport, an all-metal low-wing monoplane fitted with two 550-h.p. "Wasp" engines. Один из 27 Model 247, использовавшихся ВВС США под обозначением C-73 с двигателями Wasp военного образца, двухлопастными винтами и капотами от учебного самолета North American AT-6 Texan. Самый известный Model 247, бывший самолет авиакомпании "United", принимал участие в гонках на приз Макробертсона от Лондона до Мельбурна. На фюзеляже нанесен логотип "57 Varieties", принадлежавший спонсору - продуктовой компании "Heinz". The Boeing Transport (two Pratt & Whitney "Wasps") piloted by Roscoe Turner and Clyde Pangborn. THIRD TO ARRIVE IN AUSTRALIA: The Boeing 247-D (2-S1H1-G "Wasp"), taxying in at Mildenhall after flying over from Martlesham Heath, where it had been weighed. A FIRST-CLASS PASSENGER: An England-Australia competitor arrives in England. 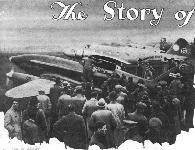 The Boeing 247-D monoplane, Comet, which Clive Pangborn and Roscoe Turner will fly in the race, on board the liner Westerland at Southampton on October 7. ZERO HOUR: The crowd watches the competitors line up. In the foreground is the unlucky Mollisons' "Comet," and behind it Col. Roscoe Turner's Boeing. "LET ME HELP!" Competition to give a helping hand with the crank of the inertia starter on the Boeing. An impressive view of the latest Boeing. N.A.C.A. 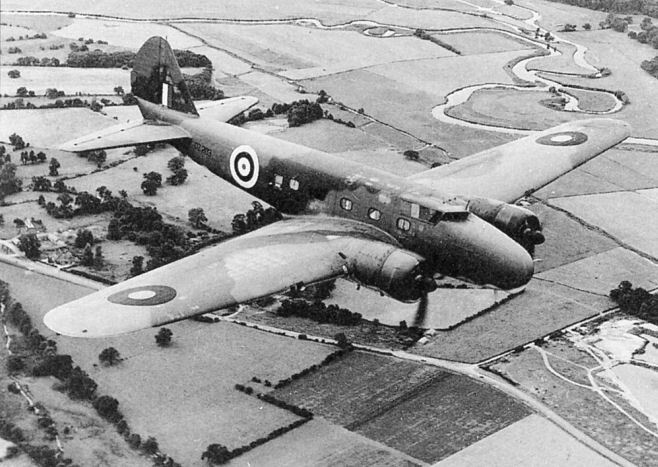 cowlings have replaced the short-chord cowlings fitted to the 247 and three-bladed Hamilton-Standard airscrews are used. 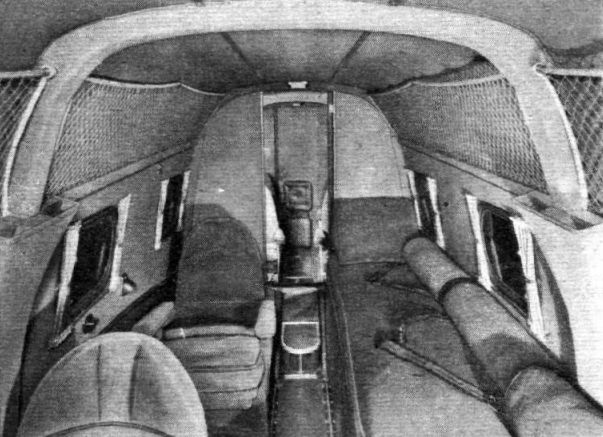 The control cabin of the 247-D, showing the mounting of the wireless aerial, the normal screen and the sliding side window. 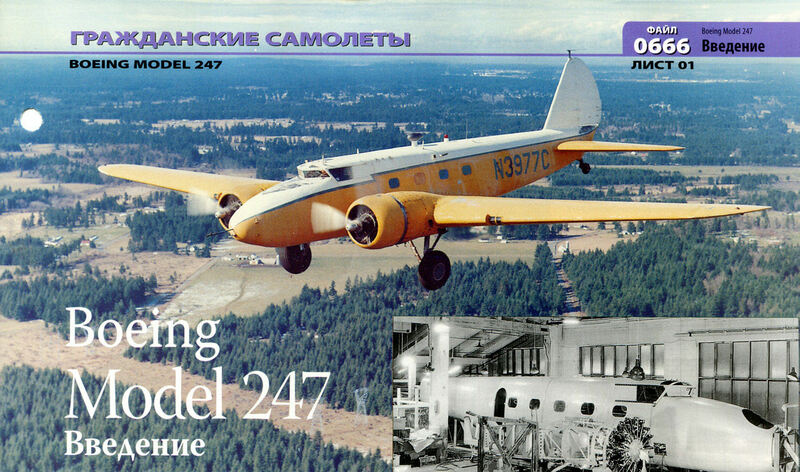 The new Boeing 247-D has shown a marked improvement in performance on the 247. The engines are geared and supercharged nine-cylinder Pratt and Whitney "H" type "Wasps." 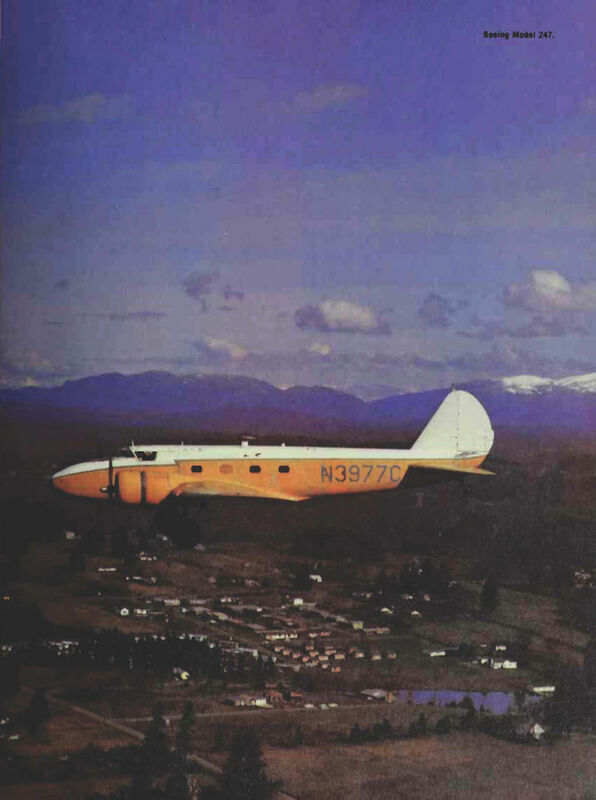 ON TEST: Col. Roscoe Turner and Mr. Clyde Pangborn flying the Boeing 247-D on a test flight before shipping it to this country. The machine is now at Heston. 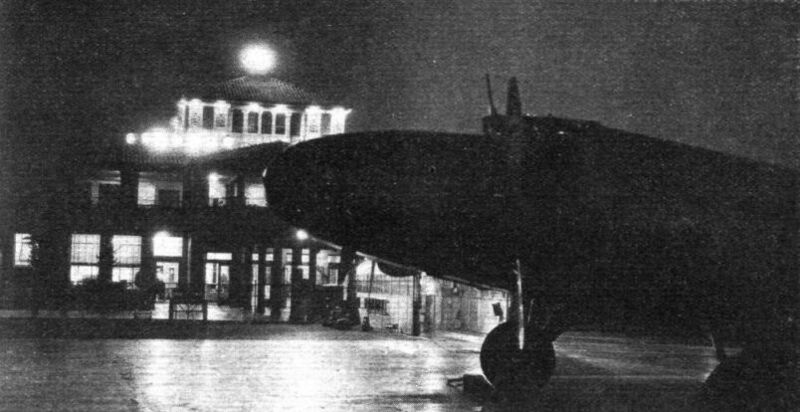 NOCTURNE: One of the United Air Lines' Boeing 247 's in front of the terminal buildings at Burbank Airport, California - which is generally considered to be America's model airport. Когда в 1930-х годах коммерческая авиация стремительно развивалась, авиакомпания "United" эксплуатировала два самых надежных самолета того времени: Douglas DC-3 (на заднем плане) и Boeing 247D. Но в конечном итоге Douglas вытеснил Boeing. Model 247D (на фотографии) отличался от Model 247 цельным капотом двигателей и фонарем кабины, откидывающимся назад. Часть машин Model 247 была переделана до этого стандарта. Этот 247D после эксплуатации в компании UAL и в Канаде был передан англичанам и стал первым самолетом фирмы "Boeing" в британских ВВС. Он использовался в Деффорде в исследованиях по созданию системы "слепой" посадки. 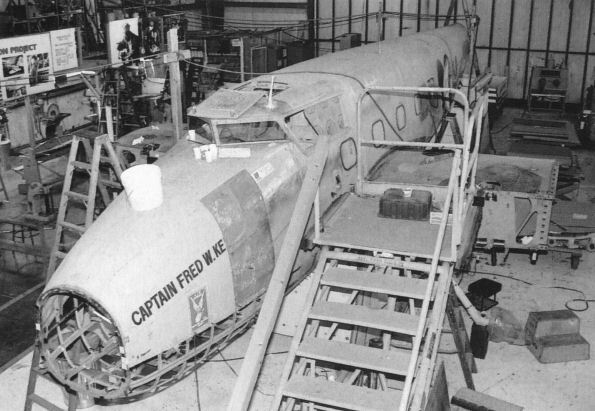 Work underway on the restoration of MoF's 247D NC13347 at Paine Field, Everett, 1989. Вооруженный авиалайнер. Седьмой серийный Model 247D, поставленный UAL под номером NC13366, в январе 1937 был возвращен на завод и переоборудован в уникальный Model 247Y. Вместимость уменьшили до шести человек, дальность увеличили за счет четырех дополнительных топливных баков, снятых с самолета, участвовавшего в гонках на приз Макробертсона, в носовой части установили два курсовых пулемета калибра 12,7 мм (на снимке) и еще один пулемет на турели в задней части салона. Самолет был продан в Китай, но о цели его приобретения и о дальнейшей судьбе ничего неизвестно. A typical American array of a few years ago, used on the Boeing 247s. 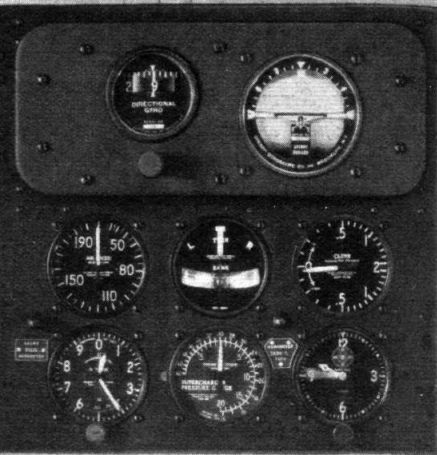 Above is the Sperry free gyro panel, while below, from left to right, can be seen (top row) an A.S.I., a turn and bank indicator, and a rate-of-climb indicator, and (bottom row) a sensitive altimeter, a boost gauge, and a clock. Interior of a Model 247D. AMERICAN LUXURY FOR THE EAST. A Boeing 247-D, with this special interior, has been delivered to Marshal Chang Hsueh Liang who is in charge of the Hupeh Province of the Nanking Government. 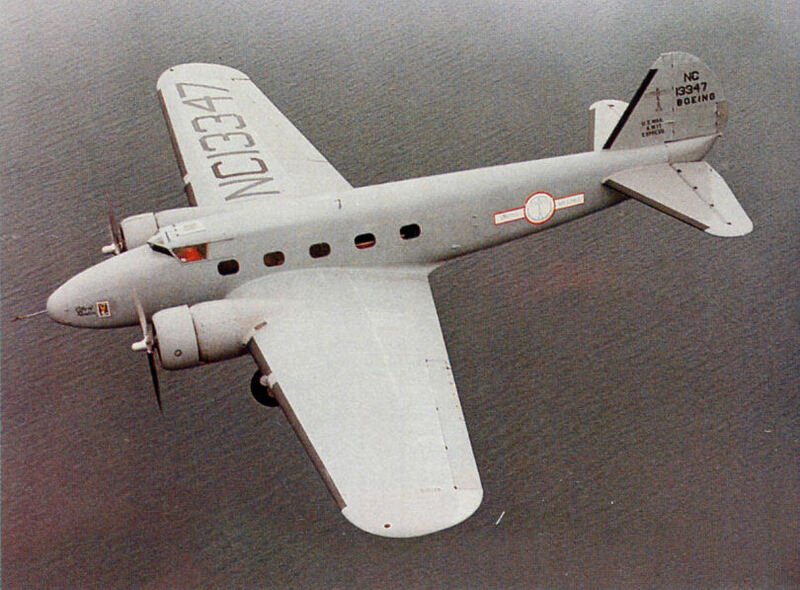 A COMMUTING SHIP - or what we should know as a business man's aeroplane, is the Boeing 247D of the American Phillips Petroleum Company. Here an official of that company is seen using an inter-'phone RT set to talk to ground wireless stations. The equipment can be used, in addition, for communication between the cabin and the pilots' compartment. 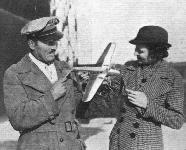 AT MILDENHALL: Mr. Roscoe Turner, one of the favourites in the Great Race and third to reach Australia, exhibits a model of his Boeing 247 airliner. 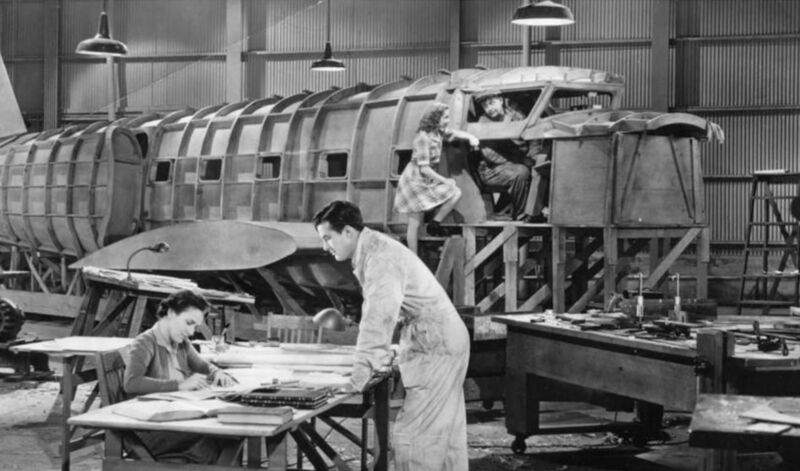 Ray Milland goes over the blueprints while Andy Devine checks out the mockup cockpit for the new “Falconer Bomber” in Men With Wings (Paramount, 1938). The storyline follows a family from the early days of flight to the beginning of World War Two. Directed by William Wellman (whose Wings won the first Oscar), this Technicolor film contains some excellent flying scenes under the direction of Paul Mantz. 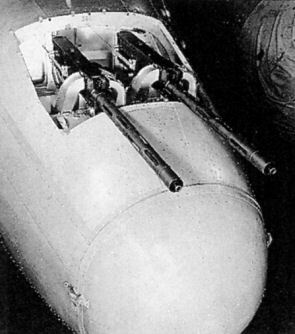 The part of the Falconer Bomber was played by a Boeing 247 for the flying scenes, one of which includes a squadron of Boeing P-12s. 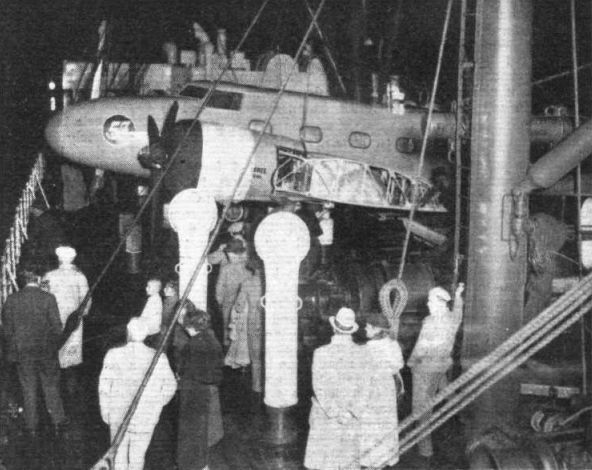 The installation of one of the landing lights in the Boeing 247-D, showing the neat method of screening. The fuselage line blends into the trailing edge of the rudder on Roscoe Turner's Boeing. Of the two auxiliary surfaces in the rudder one is a "servo rudder" and the other a "tab" for trimming. Note also the "tab" in the elevator. 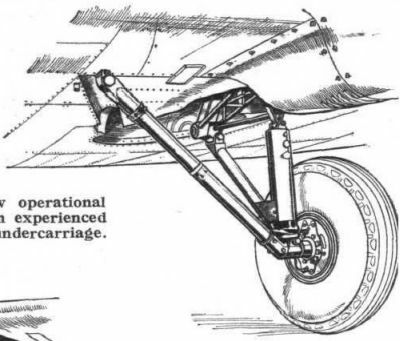 Very few operational failures have been experienced with the Boeing undercarriage. 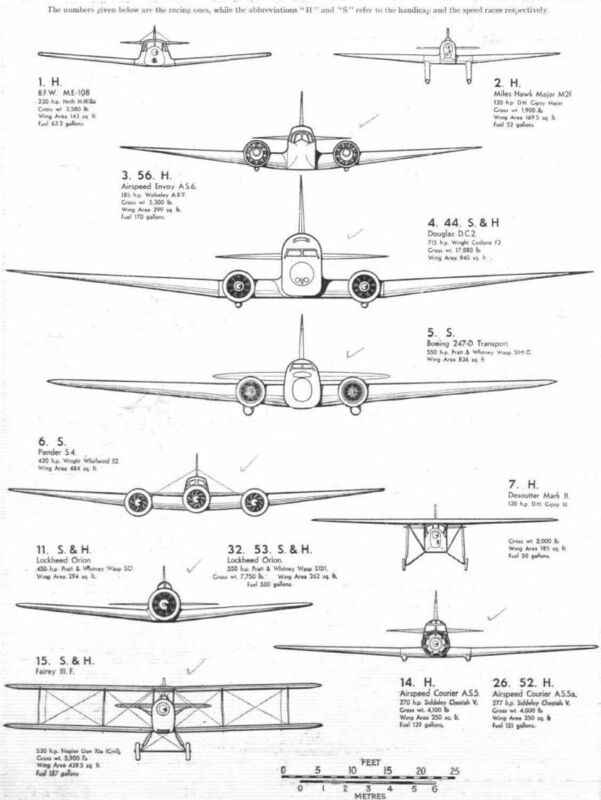 BIG CLAUS AND LITTLE CLAUS: Front elevations, to the same scale, of the De Havilland "Comet," the Douglas D.C.2, and the Boeing 247-D. These machines were first, second and third respectively to reach Australia.